My husband Phil and I are the proud owners of Blue Surf #18! My family has been visiting the Emerald Coast of Florida for at least 28 years, and we have always stayed at The Blue Surf. In July of 2010, Phil and I were engaged on the white beaches of Florida and the following June we were married there, as well. He has since become a life-long Destin Vacationer and now a property owner, too. To say we love this area might be an understatement! Our three girls, ages 15, 6, & 3, have been yearly vacationers since they were born. Going swimming to our two year old means we are headed to the beach. We purchased our first vacation property, Blue Surf 18, in May of 2016 as soon as it came on the market! Being avid vacationers and having 3 children of our own, we know how tiring and taxing it can be to haul all of your luggage on a trip without even adding in the extras that go along with taking a beach vacation - such as chairs, umbrellas, coolers, and toys. Therefore, in this property we've kept all of these extras in a storage closet ready and available for your use during your stay! There is also a pack & play (no sheet), stroller, toys, and a library of DVDs, books, and games for your family to use. We want you to have the easiest and most relaxing holiday possible! Our second property was acquired in March of 2019. We bought it with some great friends of ours as another vacation rental. 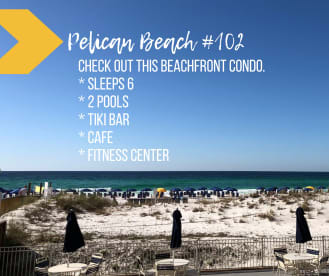 Pelican Beach #102 is totally different (but in a good way!) from Blue Surf 18. It is part of a beachfront resort community that offers a Cafe, Tiki Bar, Fitness Center, Sauna, Tennis Court, Video Games Room, a Hot Tub, and 2 Pools - one of which is indoor/outdoor. Both rentals are great for families of all kinds and are close to restaurants, shops, and different activities (other than the beach). Our home and careers are in Northwest Arkansas, but our hearts belong in Destin! Since we are a few states away from our home away from home, Phil and I use a property management company to take care of reservations, check-ins, and any maintenance issues. The girls from Destin Beach Realty will gladly answer any questions you have or help you with scheduling a trip to Blue Surf #18 or Pelican Beach #102. You can reach them directly at 888-650-8098 (www.destinbeachrealty.com). From the beaches & pool, golf, shopping, The Track for entertainment, The Village at Baytowne Wharf, hundreds of restaurants, and even a Bass Pro Shop there is something for everyone within the Destin - San Destin stretch! And both of these rentals are right in the heart of it all. We hope you'll enjoy your stay!